What is “warm and flat water”? There you go, warm and flat. I was told that I can use 'flat drink' to the drinks in which had gas but have lost all of gas then. What about the water? Does 'flat water' mean that the water once had bubbles in it but now doesn't? The expression “warm and flat” is simply the opposite of “cool and fizzy”. A carbonated drink (soda/pop) such as cola becomes flat when its lid is left open over a short period of time. When opened, CO2 molecules are converted to gas and escape in the form of bubbles; eventually, that fizz dies down and the beverage becomes "flat". In the British romantic comedy, About a Boy, the woman offering a glass of still water to Marcus, a twelve-year-old boy, was being droll, and at the same time, she was possibly trying to cheer the boy up with a small joke. 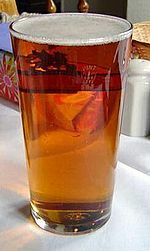 It is said that some British people prefer their beers to be served warm and flat, basically when it's at room temperature and has lost most of its head, i.e. the white frothy part. Supposedly, that is how beer or, at least, some ales should be served. Prior to the D-Day landings, thousands of American servicemen came over to Britain to train and prepare for the assault on occupied France. Naturally, there were some cultural exchanges: the Americans gave us chocolate, nylons, chewing gum and Lucky Strikes - we gave them fish & chips, rainy weather and beer served from the cask. The servicemen felt they had the raw end of the deal, and went home complaining about the warm, flat beer. Not the answer you're looking for? Browse other questions tagged expressions british-english humor or ask your own question. Is it ok to use 'before' at the end of a sentence? When did jaybirds start “going to Hell on Friday”? What is a “work wife”?